For years, a small recording studio has had two choices: Spend big bucks for a big console or petty cash for a mini mixer with a mini sound. One is overkill and the other kills the music. These days, studios based around workstations need a simple, but superb mixer. Manley has addressed this problem by presenting a choice of three different versions of the 16 into 2 Mixer: LINE, MIC, and an 8+8 MIC/LINE combination that let users select a configuration to best accommodate their studio needs. The 8+8 version mixes it up, with 8 mic channels and 8 line channels, making it a great mixing console for location recording, keyboard rigs and general purpose tasks. The Manley mixer's channel input jack is a Neutrik Combo which accepts XLR or 1/4" phone plugs. It is perfectly happy with either balanced or unbalanced sources. In the MIC version, the XLR has the appropriate 2400 ohm impedance and switches to 68K for the 1/4" plugs. There are balanced direct outputs on every channel post fade and pre cut for multitrack recording. Each channel uses the best sounding chips Manley knows of (Burr Brown INA103, OPA2604, Linear Technology LT1010) in Hutch's circuits with exceptional headroom and very low noise, real pro level input and output levels, and bulletproof Manley quality throughout. Spec-wise experts know of few mixers ever with better headroom or higher output levels and, well, this Manley mixer's subterranean noise floor and crosstalk figures are simply quite amazing. The signal path has just 3 superb polystyrene caps from input to output. No carbon resistors, just 1/2 watt metal film, Bourns conductive plastic pots, Grayhill stepped attenuators, etc. All the good stuff. Manley didn't make this thing all-tube for "ad appeal" and sales hype. They certainly could have, but the 8+8 mixer would have grown into the size of a small house, and needed an accompanying 5-Ton AC unit. 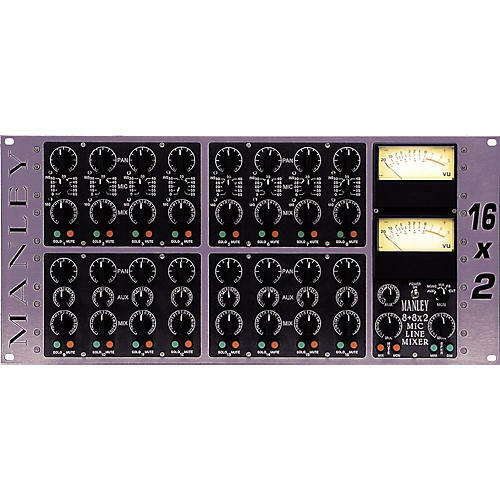 However, the tube mix amps/line drivers are right at the end and impart that "Manley Sound" to your final outputs with all the richness, loudness and BIG sound you expect from us. Built like a tank and easy to service. Mutes and Solos use superior relay switching techniques not crummy FETs or CMOS switching. The Solo is of the "mute everything else" type. The buttons are EAO Series 19 and light up to indicate Mute and Solo. Insert and Phase Reverse also use high quality relays and both functions have tiny switches and red LED's to clearly indicate when they're selected. The master section provides mixdown to 2 channels achieved with similar tube circuits as used in the Massive Passive, featuring two each 12AT7 NOS Phillips & 6414 NOS GE or Raytheon dual triodes. The M162ML console's external inputs allow two or more mixers to be combined for 32 or more channels with a mini-banana post linking the Solo functions. There are both transformer balanced and transformerless unbalanced (+4dBm) outputs with tons of headroom, +36dBu, about 10dB better than million-dollar consoles. The master section has an aux mix gain (master effects send) in the LINE version and an Ext input gain in the MIC version. The Manley M162ML mixer are two sets of monitor outputs, MAIN and MINI, so you can feed two different sets of power amps or powered speakers. Manley included MUTE and DIM buttons plus a rotary switch to monitor the main mix, the mono mix, 2 track tape playback (more balanced inputs), the Ext inputs (for linked consoles or effects returns), and the aux mix (only on LINE version). Each of the 8 Mic channels has a volume control, pan and aux knobs plus lit EAO solo and mute buttons. Internal jumper to allow Aux to be Pre-Fade, Pre-Mute, or Post-Fade and Mute. Ther is a 48V Phantom power switch for each bank of 4 mic channels. Channels 9-16 Line Inputs have XLR/1/4" combo inputs (XLR is 2400 ohms, 1/4" is 68 kOhms), direct outputs post fader balanced 1/4", 1/4" insert, stereo Ext input (for linking) (with gain trim), stereo Tape return, Mix gain with both XLR balanced and 1/4" +4 dBm unbalanced outputs. 5 position Monitor select including mono, 2 VU meters, Monitor level, mute, dim and Main/Mini outputs (unbalanced). Master Aux gain of Line version becomes stereo Ext Input gain. Each of the 8 line channels has a volume control, pan and Mic Gain knobs plus lit EAO solo and mute buttons. Mic Gain rotary switch set up for 0db (unity), 15,20,25,30,35,40,45,50,55,60 dB of gain. Each channel has Phase Switch & Insert switch on mini toggles with LED status indicators. Internal jumper to allow Aux to be Pre-Fade, Pre-Mute, or Post-Fade and Mute.